The best way to keep everyone safe is to have an adequate fence that prevents unwanted access to the pool. If children can’t get to the pool, they can’t drown in it. You certainly don’t want anyone around the pool without your knowledge. When installing the fence, make sure it is at least 4 feet high and includes a safety latch. Only adults should be able to open the gate. There are also pool covers available that are designed for safety. Consider investing in a safety cover as a secondary way to restrict access to the water. Safety signs are always great way to remind pool users to be cautious of certain dangers. Make sure you post a few signs in highly visible areas that list basic safety rules like no running. Don’t forget about shallow areas too. Children often don’t think before they jump. No diving signs are a great way to remind them of the dangers associated with shallow water. Always keep floatation devices handy around the pool. Hang a life ring on the fence or post a sign showing the designated area where safety jackets are located. In the event someone is drowning, others will already know where to get a floatation device they can use to save them. If you have children, seriously consider swimming lessons. They generally are not too expensive and can be lifesaving. 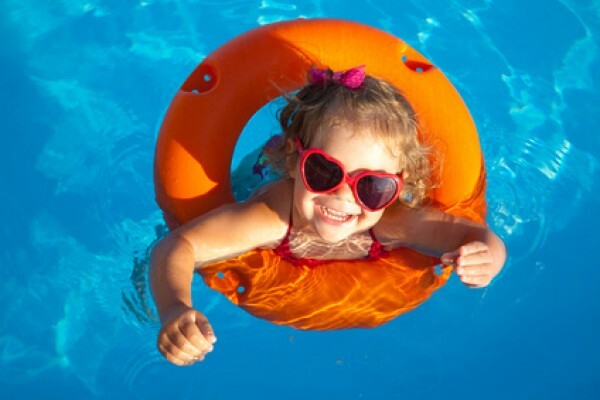 Your children will learn good swimming techniques as well as safety guidelines and survival skills if they ever have to stay afloat in open water. There is also a good chance they will learn CPR skills. Supervision is key. Never leave children unattended no matter how short a time they will be out of sight. When they are old enough to swim unsupervised, teach them the buddy system and insist they never swim alone. Also make sure they know what to do in an emergency. Have a plan set that includes calling 911 and using a safety kit. Remember, proper planning and conveying safety guidelines to pool users is the first defense in avoiding those inherent dangers. Ensuring the safety of yourself and others will make owning your own pool a more enjoyable and less stressful experience.